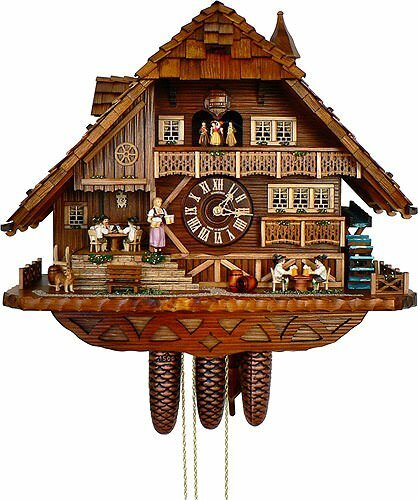 A Happy Family House cuckoo clock by Adolf Herr with an ordinary Black Forest Place with a hand-carved roof, a bell tower, a chimney and painted by hand Gentian and Sunflowers. The fogeys kiss in time to the cuckoo call, that is as soon as on the part hour and on the complete hour in line with the time. Alternating melodies – Edelweiss and Glad Wanderer – play each hour. In the meantime, the sibling’s rock fortunately on the see-noticed and the water wheel turns. The Collectible figurines on the balcony, who’re dressed in the Black Forest dress, dance round to the song. The cuckoo clock is in my opinion signed on the again through the producer Adolf Herr. His signature promises the enjoy of 6 generations of clock-workmanship. This Adolf Herr cuckoo clock comes with a certificate of authenticity (AHC). Cuckoo Clock Motion: eight-Day(weekly wind-up) Regula rack strike Motion with night time off. Clock-Face: Wood dial, diameter 4 Inches (10 cm), with Wood fingers. Dancing Collectible figurines: Handcarved and handpainted Wood couples in Black Woodland dress. Pendulum: Herr bolt pendulum with superb adjustment. Musical Motion: Reuge musical movement (22 tones) with other melodies (Edelweiß & The Glad Wanderer). Cuckoo-Hen: Wood cuckoo (hand carved). Height: 21 Inches (fifty-three cm), best clock case with bell tower, without weights and pendulum. A Guesthouse cuckoo clock by Adolf Herr with a Bavarian-styled beer space.